GENIUS – IT COULD BE YOU! Every now and then we hear about someone in school who is considered a genius. 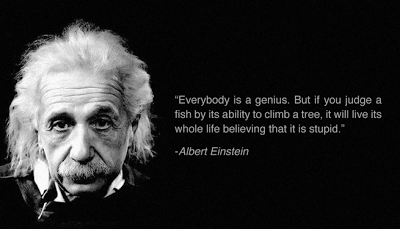 Exactly what is a genius, and what does it take to be one? The word “genius” is used to describe someone who possesses extraordinary intelligence. The way the world can recognize a genius is by knowing what he has accomplished. There may be geniuses who have never accomplished anything extraordinary and who never became famous, but their I.Q’s are, nevertheless, on par with those who have. Genius is not the same as talent. To have talent, a person has to be able to do some special type of work especially well. It means he is able to acquire a certain skill very quickly and easily. For instance, a person may have a talent for playing the piano, or ice-skating, or painting. But genius is more than talent. A genius usually contributes something to the world which we would not have without them. Now, it’s true that men and women of genius have usually specialized in some field such as chemistry, literature, music or art. But unless the general intelligence of such a person is exceptional, too, he would merely have talent. Training, practice and dedication bring out genius, but true geniuses usually has tremendous drive which enables them to work hard and long and to overcome obstacles that would stop ordinary people. In order to discover a genius or a potential genius in prospective employees, you should have them do a Personnel Potential Analysis, IQ and Aptitude tests before you hire them. What we call energy in an employee is the product of physical vigor, or health, and of a purpose, or result clearly conceived and strongly desired. In a Chiropractic office an employee who hasn’t fully adopted the purpose to help as many people as possible obtain optimum health, will stop the expansion of that practice. Those are harsh words, but true. Here’s why. The employee who is on purpose will take the initiative to arrive early, get the practice setup to accept a large flow of patients and then go ahead and fill the office up. She will answer the phone cheerfully and listen to what the new patient is saying and by her tone alone the new patient will know that they have called the right office. She will be caring, interested in the new patients symptoms and will encourage that new patient to make an appointment as soon as possible because she knows that once her doctor get his hands on that patient, the patient will immediately start to get well. And she won’t let that patient fall out of care when the symptoms go away as she knows that the condition the patient has needs to be corrected and that if the patient leaves before that, those symptoms will return. She knows that the patients have to arrive for each of their scheduled appointments and that if they miss one they need to make it up. Keeping appointments is the only way to get healthy. She is considerate of the patient’s needs and will take the time to talk to a patient when the doctor can’t and will ensure that the patient’s concerns are given to the doctor and spoken about at the very next visit. She knows that if a patient asks to cut down on their visits that the patient is in fact dropping out of care and will schedule the patient for a re-examination on their next visit. She also knows that patients need to pay for their adjustments at the time of their visit as this avoids problems, wasted time and energy in the future. Being on purpose allows her to talk freely about Chiropractic while outside the office and to be emphatic that a person she meets with symptoms should turn themselves in and get the care they are desperately looking for. She listens for when patients express improvement in their health and asks them to write up a testimonial and gets the names of one, two, three of the patient’s friends who need chiropractic care. She calls those referrals and sets up a time for the doctor to call and give those people a complimentary phone consultation. She role plays the basic procedures with her other staff and ensures that the systems are in place for educating patients so they don’t fall out. Taking the initiative and coming up with ideas for Workshops in the clinic, promoting them and ensuring they are well attended is something she looks forward to and enjoys. By now you’re probably thinking that this type of employee doesn’t exist and I’ve made it all up. I haven’t. This is exactly the type of person you need in your office if you ever expect to succeed. There are probably more attributes that this person has that I haven’t mentioned. Well here’s one more. She will stay with you for years no matter what you do because she knows you are saving the lives of those people you adjust. She takes pride in the fact that she can help someone who is genuinely helping others. If you don’t have an employee like this, the best way to find her is to start the hiring process and test the applicants using the Personnel Potential Analysis, IQ and Aptitude tests and she will magically appear. Visit http://www.measurablesolutions.com to do these tests. The spectacular growth of chiropractic profession during B.J. Palmer’s ascendancy (1913-1924) is inseparable from the concurrent expansion of the Palmer School of Chiropractic (PSC) and B.J.’s many related businesses. In that era and for decades to come, Palmer, the “Developer,” accurately proclaimed that his “Fountain Head,” the PSC, had graduated 75% of all the chiropractors in the world. In the years immediately following World War I, when federal educational support for veterans became available and the PSC enrollment approached 3,000 students, B.J. truthfully claimed that his was the largest vocational institutional in the nation, probably in the world. Given its preeminence among chiropractic schools and B.J.’s predilection for extraordinary claims, Palmer and his Fountain Head became a major target for medical critics (Brennan, 1983). Palmer delighted in responding to the criticisms from political medicine. He taunted them, and turned the would-be negative publicity they heaped upon him to his advantage. He had built his “science” with printer’s ink, he declared, and would buy it by the train load. The “P.T. Barnum of Science” knew few limits in his capacity to spread the gospel of chiropractic and the legend of the PSC. When the Illinois Medical Journal branded him “the most dangerous man in Iowa OUT of a prison cell” and as an “insane…paranoiac, a man whose irresponsibility is criminal,” B.J. reveled in his supposed ignominy and responded with posters depicting himself in front of prison gates (Gromala, 1984). In this period also, B.J. completed perhaps the most scholarly work of his career, An Invisible Government, which offered a scathing indictment of organized medicine and its efforts to monopolize health care. “Maliciousness based on prejudice,” he suggested, was at the heart of the medical trust (Palmer, 1917a, p. 16). B.J. learned the craft of advertising from mentors such as his father and Elbert Hubbard. The latter was a writer, publisher, lecturer, craftsman and highly successful businessman from upstate New York. Hubbard was also the son of a well-regarded physician who had vigorously promoted the “germ theory” in the latter part of the nineteenth century (Lerner, 1954, pp. 667-76). Elbert Hubbard had dropped out of Harvard University and become a popular “free thinker.” His literary talents brought him to national prominence, and he promoted an anti-intellectual intellectualism that caught B.J.’s fancy. “All colleges are worthless societies; they develop indolence, conceit and theoretical nonsense,” declared the iconoclastic Hubbard (Lerner, 1954, p. 668). His several years as a writer for Arena Magazine of Boston brought him in contact with the drugless healing movement and with turn-of-the-century opposition to the spread of medical practice laws. Hubbard established his Roycroft printing plant and furniture factory in East Aurora, New York and marketed his products nationwide. He adopted attention-grabbing attire, catchy epigrams and the “Simplified Spelling” method then promoted by Harvard University. His eccentricity caught the public’s eye, and his publishing empire flourished, despite or perhaps because of the criticism it attracted from the establishment. His lecture tours brought him to Davenport, Iowa in 1906, where he spoke at the Burton Opera House. We may speculate about whether B.J. was in attendance on that occasion. In any case, in 1908 Hubbard sought out B.J. and the PSC, which were just beginning to gain a national reputation. Hubbard was impressed with the young doctor, and the two became fast friends. B.J. adopted Hubbard’s style of dress (loose-fitting blouses and large, flowing ties), long hair, publishing style, use of “reformed spelling” and mode of business practice (Gromala, 1984). The two iconoclasts frequently visited one another at their respective headquarters, and B.J. named one of the rooms in his mansion after the East Aurora guru (Palmer, c1977, p. 97). In the opinion of the American Medical Association (AMA), advertising was a serious professional sin. The ethical standards of the AMA forbade its members to advertise, other than to list their names, addresses and phone numbers. But B.J. had no such scruples, and decried political medicine’s efforts to prevent non-AMA members (most especially chiropractors) from promoting their practices. Over and over again he reminded his readers that “It pays to advertise!” Health care, he suggested, was a commodity, and should be marketed and sold just like any other consumer item or service. Advertising was as American as apple pie, and AMA et al. had no right to interfere. Among the most important of his many publishing ventures was the so-called “Palmer Weekly,” B.J.’s personal newsletter, the Fountain Head News (FHN). Established circa 1912, the FHN was significant not for its financial rewards to the Developer (FHN was initially distributed free), but because it connected him to the field, and they to him. The PSC’s monthly journal, The Chiropractor, increasingly functioned as the official periodical of the Universal Chiropractors’ Association (UCA), and featured an ever greater number of articles written by the protective society’s membership. B.J. felt the need for his own, more intimate professional forum. The correspondence reprinted in the pages of the FHN is of special historical importance. It mattered not whether the writer expressed pro- or anti-Palmer sentiments: B.J. published it all the same. (Of course, he always got the last word in his own newsletter.) Owing to his eagerness to share both the positive and the negative feedback he received with the field, the FHN became a rich weekly chronicle of current events in the profession. Here the Developer held court, exhorted and cavorted, praised his supporters, reprimanded his opponents and detractors, and filled his readers with “spizzerinctum.” The “PSC boys,” as he called his alumni, could stay in close touch with their leader and their alma mater, and felt some sense of security amidst the ever growing persecution from organized medicine, because B.J. was obviously on top of whatever was happening. The FHN let its readers know that the Developer was going to defend them and save them, especially if they were PSC boys and/or UCA members. The FHN employed the new system for marking the years that B.J. devised, for example, “A.C. 28” for 1922. First introduced with the June 24, 1916 issue of the FHN (Volume 5, Number 19), the “A.C.” dating of the newsletter was a parody of Christians’ “Anno Domino,” and marked time from 18 September 1895, the supposed date of the first adjustment. It was characteristically B.J., and reminded his audience with every issue that chiropractic was as significant as religion, and that its date of discovery was at least as important as the birth of the Nazarene. And no one should forget who bore the cross for chiropractic. The FHN was but one component in B.J.’s ever growing publishing empire. The PSC also produced The P.S.C. Clinical Journal, The Chiropractor, and a wide range of “disease tracts” and wall charts (Palmer, 1917b), and, of course, the well known series of volumes referred to as the “green books” (Wiese & Lykins, 1986). Palmer showed no sense of exclusivity or proprietorship about advertising ideas. He welcomed innovation from his “boys” in the field, and shared novel tactics with his FHN readers. He was particularly partial to the “free clinic idea,” wherein chiropractors offered their services gratis to the indigent or to children or to uniformed servicemen and veterans. Free clinical services had been used to good effect in the early efforts to attract the attention of legislators to the new discipline, and were well received by the disabled soldiers of the world war. Palmer was happy to collaborate on most any project which raised the visibility of the profession. “Palmergrams” (Palmer, 1949, pp. 225-7; Wills, 1987, pp. 102-3) or “travelgrams” (An, 1919; Ashworth, 1920; No, 1919; Palmer, 1923) may be seen as an extension of the free clinic promotions. A Palmergram was a certificate issued by B.J. which guaranteed chiropractic care, at no charge to the patient, and reimbursement to any chiropractor who accepted the case. Circus workers were frequent recipients. The Developer’s enthusiastic alumni were usually more than happy to acknowledge the publicity that Palmer had brought to them, and provided service gratis. B.J. let it be known that any doctor who objected to providing the chiropractic care without compensation could send the bill to him, and Palmer would pay. Anyone who sent in such a bill, or any chiropractor who refused to provide care, could expect to hear about it in the FHN. There is no shortcut to becoming an executive. It entails study and practice, based on sound principles and knowledge. But how gratifying the achievement a well-organized practice is that helps sick people get well. For many years while attending college, Graduates have spent much time and energy wondering how they will build their practices to accommodate as many people as possible. They were so awed by the prospect of being in practice that they approached this all-important phase of their career in fear and trepidation. Now they must drop their timidity and take up the study of the principles and procedures of running a successful practice with confidence and delight. While planned primarily for the Graduate, the book, “The Graduate and the Master” is of inestimable value to those who are, or have been stagnant in practice, or those who wish to break through a plateau to a new higher level. in the requests for help I have received from many Chiropractors. In the days of D.D. Palmer it was imperative that Chiropractic be thrust forward into an ailing society. This they did! However, this thrust must be permanently etched in the mind of every Graduate and Master. The great men of Chiropractic have already done the observing, thinking, discussing, listening on the subject of the Spirit, Mind and Body, and techniques have been developed to put the resultant principles into practice. What has been missing from the curriculums is the art, science and practice of management. This book is designed to get the Graduate and the Master into the right frame of mind to realize that they do not know all there is to know about being in business. Why reinvent the wheel! Study this book, attend practice management seminars and receive personal consulting so that you truly excel in practice, minus the stress, aggravation and self-doubt so evident among the ranks of today’s practitioners. May this be the greatest step you take in your life and the many lives of the others you will surely help. Let Chiropractic be the number one health care choice.